Perhaps this game would have been better suited with the title "Smashing Drive", but Burnout is fine. 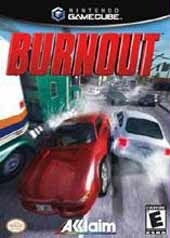 The reason I said that is because Burnout has some of the most realistic, and fairly graphic crashes ever seen in a video game (until the point Burnout 2: Point of Impact came out). While this is certainly the draw or the hook of the game, the developers slightly downplay the crashing. It's basic arcade racing with the encouragement of reckless driving. If you can drive dangerously successfully, you can earn a boost for even more unlawful fun. But Criterion Studios never took full advantage of the crashes. It's just there. It wasn't until the sequel that crashing became a little more integral. But the crashes are one to behold. While it doesn't have as much particle effects as the sequel, the original does plenty. Some crashes are rather lame like a small fender bender or a scrape on the wall. But then there's the moments when your car files and flips smacking into the oncoming traffic. And there is some car damage and deformation, but doesn't last. Right after you crash, your car looks new. Hmmm. Graphically, Burnout is really nice, and slightly better than the PS2 version (and also offers Progressive Scan, which isn't that important to me, since I can't use it). It runs at a full 60FPS and has an amazing sense of speed. The cities are large and well detailed, and surprisingly, the frame rate doesn't hitch. The game also has some great lighting and reflectiveness. There are some flat textures and average particles in the crashes, but this is a good looking game. The audio portion is great. The music is standard techno, but the best part is the crashing sounds. It sounds very realistic and loud (thanks to Dolby Surround). Turn off the music and turn up the game loud to experience some great crashes. The game play is fairly limited, especially when you compare Burnout to other racers such as Gran Turismo 3 or the Need For Speed series. The main portion of the game is the championship mode, which is actually easier to complete than the PS2 version. It's not until the last couple of portions of the championship where things start to pick up. There's the single race mode, which is fun anytime you want to play a quick game, and the time trial is much like the single race, but without the competition. One of the more challenging modes is the Survival mode that opens up after completing the game. You have to finish any course without crashing, and it's no easy task. I have yet to complete one course in Survival mode. This increases replay value some, but there needed to be more. Burnout's biggest letdown is in the replay value. There's only about 6 actual courses with variations, and not too many modes of game play which I mentioned above. It's still fun to pick up, play and crash, and let's face it, the Gamecube is not basking in the same wave of racing games as other consoles right now. And with what racers there are on the GC, good ones are few and between (as of 10/02). Seeing how Point Of Impact is already out on the PS2, you should find the original on the cheap.